WAS BRITAIN A FOUNDER MEMBER OF THE EUROPEAN UNION? No. Britain declined to join the European Union’s forerunner, the European Coal and Steel Community (ECSC), when it was founded in 1952. Labour Prime Minister Clement Attlee told parliament in 1950 his party was “not prepared to accept the principle that the most vital economic forces of this country should be handed over to an authority that is utterly undemocratic and is responsible to nobody.” There was also concern it might make close ties with the Commonwealth and the United States more difficult. Britain also stayed out of the European Economic Community when it was formed from the ECSC in 1957. Conservative Prime Minister Harold MacMillan reversed this position in 1961 and sought membership of the EEC. With Europe divided in the Cold War, he said the promotion of European unity and stability through the bloc was “so essential a factor in the struggle for freedom and progress throughout the world.” But France led resistance to Britain’s membership in the 1960s, with Charles De Gaulle blocking Britain’s accession in 1961 and 1967, accusing the British of “deep-seated hostility” to the European project. As he signed the treaty taking Britain into the common market, Conservative Prime Minister Ted Heath said “imagination will be required” to develop its institutions while respecting the individuality of states. In 1975, new Labour Prime Minister Harold Wilson, faced with splits among his ministers on Europe, decided to hold an “in-out” referendum on membership. He backed staying in after saying a renegotiation on terms of membership had “substantially though not completely” achieved his objectives. Britons voted 67 per cent to 33 per cent to stay in the European Union in 1975. No. Although new Conservative leader Margaret Thatcher backed the campaign to stay in the bloc in 1975, her premiership saw her party become increasingly divided by the issue and her own relationship with EU leaders was tense at times. She attacked the idea of a single currency and too much power being centralised in EU institutions, telling the then-Commission President Jacques Delors “no, no, no” over his plans for more European integration in 1990. However, days later she was challenged for the leadership of the party by pro-European Michael Heseltine, and was forced from office when she failed to beat him outright in November 1990. What was John Major’s role? Her successor, John Major, was forced to pull sterling out of the European Exchange Rate Mechanism (ERM) on so called ‘Black Wednesday’, September 16, 1992. The ERM had been intended to reduce exchange rate fluctuations ahead of monetary union. Major was also beset by divisions over Europe, describing three eurosceptic cabinet ministers as [expletive] in 1993 after narrowly surviving a confidence vote over the EU Maastricht Treaty. Why did David Cameron push for Brexit? The tenure of the next Conservative Prime Minister, David Cameron, was also, ultimately, defined by Europe. The Conservatives returned to office in 2010 after 13 years of Labour government. In a bid to shore up support for the Conservatives in the face of a split party and the small but staunchly eurosceptic UK Independence Party (Ukip), Cameron promised an “in-out” referendum on a renegotiated deal on membership in the party’s 2015 election manifesto. Cameron said he was satisfied that negotiations with the EU gave Britain enough for him to back a “remain” vote. But though Britain’s biggest parties backed the campaign to stay in, the people voted to leave by 52 to 48 per cent on June 23, 2016. Cameron resigned the morning after the vote and was replaced by Theresa May. How did Theresa May follow up? 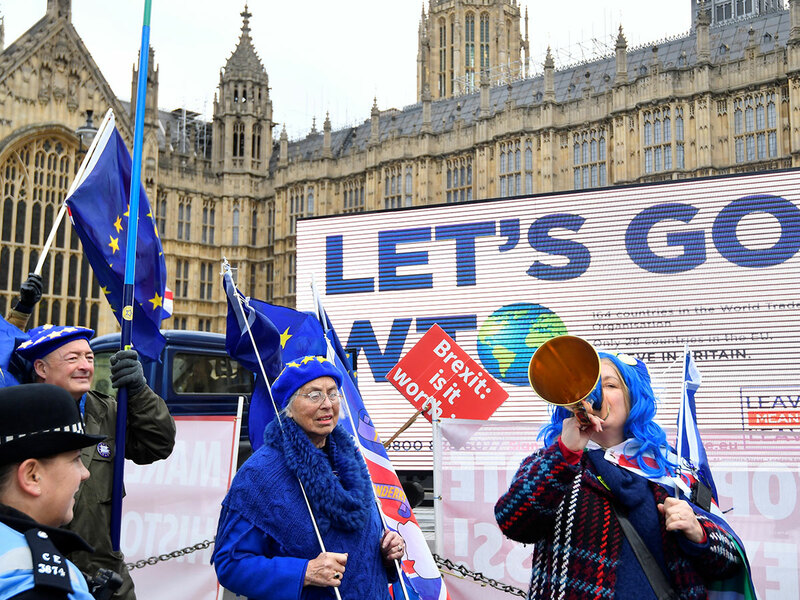 May triggered Article 50, the formal EU divorce notice, in March 2017, setting the exit date of March 29th, 2019 for Britain to leave — with or without a deal. In a bid to gain backing for her Brexit plan, she called a snap election for June 2017. The gamble backfired. She lost her parliamentary majority and formed a minority government, supported by the eurosceptic Northern Irish Democratic Unionist Party (DUP). On November 13, she reached agreement on the terms of Britain’s departure from the bloc with EU leaders.